Discussion in 'The Tiki Bar' started by dvx216, Jan 24, 2019. So it's winter time so here's some goats in a boat. Looks like they're eating the upholstery... OH NO! It's official!.....I've seen it all now. That goat in the center reminds me a bit of me.....a horny old goat! So have goats now replaced pigs on boats? That's what you call a Goatfast boat! sbw1, Handsome Transom, hottoddie and 1 other person like this. I thought this would be about Tom Brady on Belicheck's boat. This is much cuter and more appreciated by most I suppose. I thought you were talking about the old goats driving these boats! This old goat would rather see sheep....Bahhhhaaa! I think horny old goats have been mentioned. 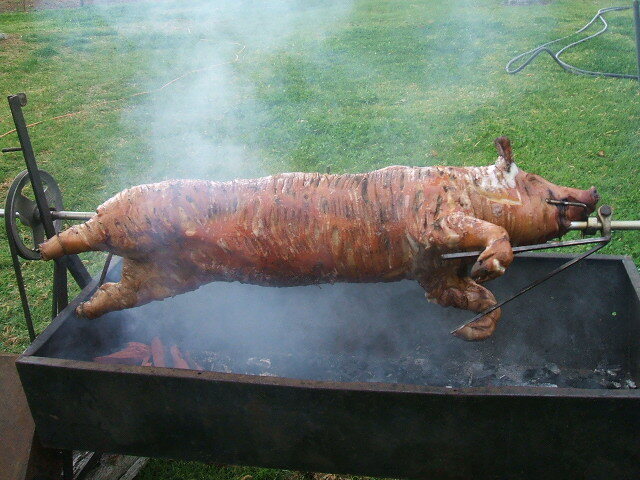 I prefer a pig on a spit. dtfeld, Craig, Windjammer and 1 other person like this. When I was a kid we lived on a farm and had Bart the goat. We would put him on a 30' rope and tie the rope to a stake in the ground. He would eat the grass in a perfect circle and the perfect height like it was just cut by a lawnmower... We had a couple acres of grass and would move the stake around.... making these perfect overlapping circles. CliffA and Blueone like this.